A great way for tourists to travel between Waterloo and St. Jacobs in Ontario, Canada is by train. The Waterloo-St. Jacobs train in Ontario, Canada is the ideal way to do some sightseeing as the train makes three stops between these towns where you can disembark and then board again on a later train. The 6520 diesel locomotive was built in 1957 and you can not miss the bright yellow and black train as it passes by. St. Jacobs-Waterloo train, Ontario, Canada, North America. 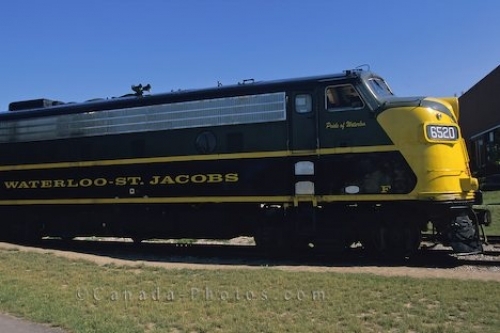 Picture of the train that goes between Waterloo and St. Jacobs in Ontario, Canada.